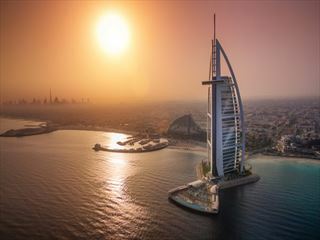 Nestled on the tip of The Palm Jumeirah’s crescent and offering the most spectacular views of the Arabian Gulf and soaring Dubai skyline, Rixos The Palm Dubai offers pure indulgence and elegance close-by to Dubai’s main attractions. The rooms here are sophisticated and comfortable, with plenty of luxurious amenities and spectacular views from their private balconies. Once you’ve woken in your large, comfortable bed, the resort’s restaurants and bars offer plenty of sumptuous cuisine and refreshing drinks to keep you going throughout the day. If you fancy truly relaxing, the beach with its private cabanas and sun loungers is only steps away, whilst the Anjan Spa offers beautiful, serene Turkish treatments that will make you feel incredibly relaxed. Those hoping for a bit more adrenaline with love the exciting water sports on offer, and there is plenty of great live music and entertainment in the evenings. With a family pool, a children’s pool and an adult-only pool, this resort is brilliant for any kind of traveller. Couples will relish in romantic dinners at the idyllic L’Olivo Ristorante, whilst families will love the Rixy Kid’s Club, giving mum and dad the chance to unwind. 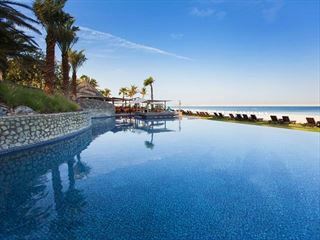 Perched on the tip of The Palm Jumeirah’s crescent, Rixos The Palm Dubai offers true beachside indulgence, and is only a short drive from Dubai’s shopping centres and incredible landmarks. Deluxe Room – Classy 53sqm rooms with the standard amenities. Choose between sea views or views of the resort’s landscape park. Premium Room – Larger 65sqm room featuring a lounge with a sofa bed, a writing desk, and a comfy chair, plus a balcony (subject to availability) with sun loungers. Wellness Room – Sitting adjacent to spa, these 52sqm rooms offer gorgeous views of the Palm Lagoon, direct access to the semi-Olympic lap pool and the beach. They also feature their own private garden and plunge pool. Junior Suite – Lavish 70sqm suites featuring a cosy lounge area, balcony (subject to availability) facing the Palm or the ocean, plus a private study. Senior Suite – Luxurious 90sqm suites with panoramic views of the Palm lagoon or the soaring skyline. 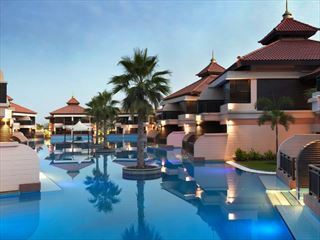 Features a bedroom with a walk-in wardrobe, balcony with sun loungers, a beach or pool cabana, and flowers on arrival. Two Bedroom Suite – Spectacular 150sqm suites featuring a master bedroom with a king size bed and walk-in wardrobe and a second bedroom with two twin beds and a sitting area. Also features two bathrooms, a lounge area, and a balcony or terrace with sun loungers. King Suite – Spacious 380sqm suites offering pure indulgence. Featuring stunning views of The Palm Jumeirah and the Arabian Gulf from the three balconies with sun loungers, plus a master king-size bedroom, a second twin bedroom, a pantry area and dining table, and three bathrooms. Garden King Suite – A sumptuous 580sqm penthouse suite offering a 360° panorama of The Palm Jumeirah and the city skyline. Featuring a large veranda with a lounge area and hot tub, an indoor lounge area with a large dining table, complimentary WiFi, a luxury transfer from and to the airport, and a full bar set-up. L’Olivo Ristorante – A romantic and elegant restaurant serving up a delicious mix of Mediterranean and Italian cuisine. The ambience here is tranquil and relaxed. Open 7pm-11pm. Aegean Restaurant – A delectable seafood restaurant overlooking the Arabian Gulf shoreline. Open 7pm-11pm. Closed during the summer. El Chiringuito – A laid-back bar with an Ibiza feel, serving up great cocktails and food in a cool al-fresco style. The Bar – Serving up fantastic premium drinks in a trendy setting. Highlights – Nestled right by the pool, offering refreshing poolside drinks and snacks. I-Chill Beach Lounge – Overlooking the gorgeous Dubai skyline, serving up delicious beachside food and drink in a relaxed setting. Rixy Kid’s Club – with fun games, an outdoor playground and an activity room for 4-12 year olds. Anjana Spa – A blissful and relaxing spa offering a nod to traditional Turkish therapies and treatments. Turkey is well known for its rich tea grown in the historical town of Rize on the Black Sea coast, and so the products here are derived from this flavoursome and rejuvenating tea. Treatments include traditional Turkish hamam rituals, body wraps and massages. Features a steam room, sauna, ice fountain and Jacuzzi. During the holy month of Ramadan or special religious days (see important info) alcohol timings are adjusted according to government rules and regulations, the hotel reserves the right to do so in altering hours of food and beverage or other outlets from time to time with no liability in this regard and without prior notification.